The U.S. 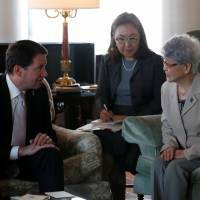 Ambassador to Japan on Tuesday met the families of Japanese nationals abducted by North Korea agents decades ago to train its spies, just a week before Prime Minister Shinzo Abe is expected to raise the emotional issue at a summit with U.S. President Donald Trump. The issue is a top domestic priority for Abe, whose support has been undermined by scandals over suspected cronyism and cover-ups. But Tokyo worries it could take a back seat to nuclear and missile issues in a series of summits planned with North Korea. Pyongyang admitted in 2002 it had kidnapped 13 Japanese in the 1970s and 1980s to train as spies, and five of them returned to Japan. Abe has said he will not rest until all 13 have come home, making the issue a keystone of his political career. In an apparent nod to Japan’s concerns, U.S. 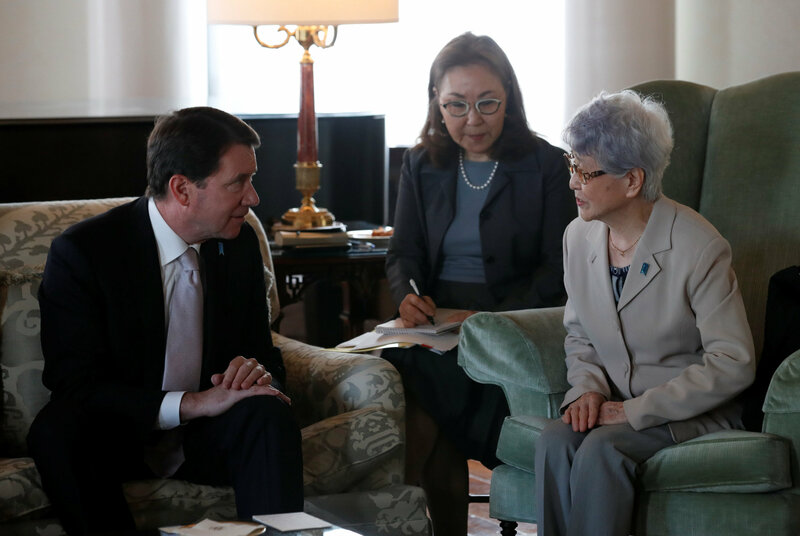 Ambassador William Hagerty and his wife met abductees’ family members, including Sakie Yokota, whose daughter Megumi was snatched from a beach as a teenager 40 years ago. Trump, who met Yokota among other relatives of abductees when he visited Japan in November, has incorporated the story of Megumi into his attacks on Pyongyang. “Even today, as we speak, we don’t know where they are, what life they are pursuing,” Yokota said. “We haven’t even seen one single photograph of them. Hagerty told them their plight had not been forgotten, pledging to convey their stories to Trump ahead of his summit with North Korean leader Kim Jong Un. “We’re deeply saddened by the misery these family members have endured,” he said after meeting with them for roughly an hour at his residence in central Tokyo. “I know that this issue is high on the list of priorities for both President Trump and Prime Minister Abe,” he told reporters. Trump was the third president met by Yokota and the others. In the past, they have expressed frustration at how long their struggle has lasted, and appealed for action. “That there has not been a result is very tough for us, who have suffered by not having any chance to meet our loved ones for such a long time,” said Shigeo Iizuka, whose sister, Yaeko Taguchi, was taken in 1978, leaving behind two infants in a nursery.